A biopsy refers to surgically removing a piece of tissue from anywhere on the body to be analyzed by a pathologist. Biopsies can be both internal and external, and can be obtained from any organ such as the skin, liver, pancreas, lymph nodes, kidneys, intestines, lungs, bone, and many others. Surgical biopsies are generally recommended when an abnormal lesion, mass, lump, or growth is found during an exam or on internal imaging such as a radiograph, ultrasound, MRI or Cat Scan. One of the main reasons to perform a biopsy would be to determine if cancer is present within a specific organ or tissue. 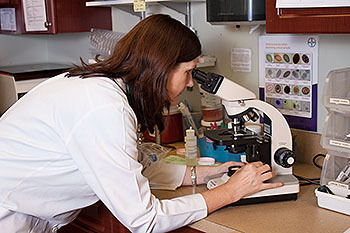 Biopsies can also aid in the diagnosis of inflammatory lesions (ie hepatitis or inflammatory bowel disease), auto-immune diseases (ie pemphigus or lupus), infectious diseases (ie Feline Infectious Peritonitis or Rabies), parasitic lesions (ie demodex on the skin or worms hiding within organs) and other diseases (ie neuromuscular disorders). Biopsies are important because they provide so much information about the disease process and are a key factor when deciding the next step regarding treatment. For example, biopsies are often the only way to determine whether a growth is malignant (cancer) or not, and whether a simple surgery or an aggressive surgery is needed to remove the lesion, and if radiation, chemotherapy or additional medications or therapies are needed. There are three main types of biopsies including a needle biopsy, punch or wedge biopsy, and an excisional biopsy. Needle biopsies are obtained by inserting a fine needle into an area of abnormal tissue. The cells in question will be trapped into the needle which is flushed with air to spray the cells onto a microscope slide to be evaluated. This type of biopsy often the least invasive, only slightly uncomfortable for your pet, and can be guided with the help of an ultrasound when the targeted organ or lesion is inside the body in an area that cannot be easily seen or felt. The down side to this type of biopsy, is that it is the least likely to provide a diagnosis due to the small sample size. Punch or wedge biopsies, also called incisional biopsies, are a bit more invasive. This type of biopsy is where only a small piece of abnormal or targeted tissue is removed with a sharp instrument such as a scalpel blade or punch tool. The benefit of this type of biopsy is that it is larger than a needle biopsy giving a more representative sample of the area under question. The purpose of an incisional biopsy is not to remove the entire lesion, but instead provides a specific diagnosis allowing the doctor to create a very detailed and appropriate plan for the surgery and/or treatment based on a known diagnosis. For example, if the incisional biopsy results conclude that the tumor is a locally aggressive type of cancer, a larger area of normal tissue around the tumor will need to be to removed during a subsequent surgery. Where a benign or less aggressive type of cancer would require a much smaller incision to cure the lesion. Also more aggressive cancers may benefit from pre-surgical chemotherapy and/or radiation to reduce the size of the tumor and to decrease the chance of recurrence. Basically, an incisional biopsy provides vital information to help optimize the treatment plan with hopes of a higher likelihood of a cure. Excisional biopsy is the most aggressive form of biopsy because it is designed to attempt to remove the entire abnormal lesion or tumor. The major benefit of this type of biopsy is that it has the best chance of obtaining a specific diagnosis, in pets with cancer it provides vital information about the margins around the tumor to know if all the cancer cells were likely removed, and best of all it gives the surgeon the potential to completely cure locally based cancerous tumors that have not metastasized. This type of biopsy is reserved for growths, lesions, and masses that are in locations and are small enough in size that it can be fairly easily removed while retaining enough normal tissue around it to close the incision with minimal tension. Most biopsies require either local anesthetic block (+/- sedation) or general anesthesia. In the case of local anesthesia (such as for skin biopsies or small mass removals), if your pet is cooperative, we may not need to use any sedation. A local block is often only slightly and briefly uncomfortable for your pet, providing complete numbing of the area to easily remove the tissue needed for submission to the lab. This works well for small incisional or excisional biopsies in easy going pets. For internal biopsies, more invasive or painful biopsies, and scared or uncooperative patients, sedation or general anesthesia will be needed for the safety and comfort of your pet. Since sedation and general anesthesia carry a small amount of risk, it is important to minimize this risk by checking to see that your pet is in overall good health before undergoing any form of anesthesia. Testing requirements will be based on your pets age, illness, previous medical history and reasons for doing the biopsy. The most common tests might include blood work, urinalysis, blood pressure measurement, an EKG, x-rays, or an ultrasound. The results of these tests, as well as, the risks and benefits of anesthesia and the procedure will always be discussed with the owner. What are the Risks of Doing a Biopsy? While the biopsy itself is usually not dangerous, there can be a small risk of bleeding (especially for internal organ biopsies), dehiscence (opening up of the incision site), or infection after the surgery. Plus, as discussed above, there are also some potential risks if general anesthesia or sedation is needed. Typically biopsies are safe surgical procedures that pets recover quickly from. Most external biopsies don’t require a hospital stay. In fact, pets that undergo a biopsy with a local anesthesia block or light sedation, can usually go home fairly quickly. For internal biopsies or more extensive external biopsies that require anesthesia, we may recommend a stay of at least one night, but this is more the exception than the rule at Harmony Animal Hospital. Should we recommend for your pet to stay one night, it is to allow your pet to recover from the anesthesia, monitor and treat pain, and to be able to assess the surgery sites the next morning. Once home, the care you will need to provide your pet will be minimal and generally does not require you to be home with your pet at all times. You may need to give your pet pain-relieving medication and/or antibiotics. You will also need to make sure your pet does not lick the biopsy sites; and until the stitches are removed, they should also not participate in any intense activities, as there’s always the risk of the incision becoming infected or opening up. Between 10-14 days after surgery, you will need to bring your pet back for us to evaluate the biopsy sites and to remove the sutures. The pathology report usually takes about 7-10 days, we will call you with the results and advise you on further monitoring, treatment, and prognosis. As always, if you have any concerns or questions before or after any procedure at Harmony Animal Hospital, we welcome your call and would love the opportunity to assist you and your pet in any way we can.